With the U.S. Treasury yield curve having briefly inverted during the past few weeks, we're increasing the cadence at which we will feature our recession probability track. The good news is that constant maturity 3-Month and 10-Year U.S. Treasuries were only mildly inverted between March 22, 2019, and March 28, 2019, where the spread between them has since become positive. The spread, however, remains near zero, where at 0.20%, the average spread between the two Treasury yields over the last rolling one-quarter period has dropped below a quarter point. The good news is that constant maturity 3-Month and 10-Year U.S. Treasuries were only mildly inverted between March 22, 2019, and March 28, 2019, where the spread between them has since become positive. The spread, however, remains near zero, where at 0.20%, the average spread between the two Treasury yields over the last rolling one-quarter period has dropped below a quarter point. Combined with the average Federal Funds Rate of 2.40% over the same period, the probability that the U.S. economy will enter into a national recession at some time in the next twelve months has risen to nearly 7%, or roughly a 1-in-14 chance according to Jonathan Wright's 2006 recession prediction model. 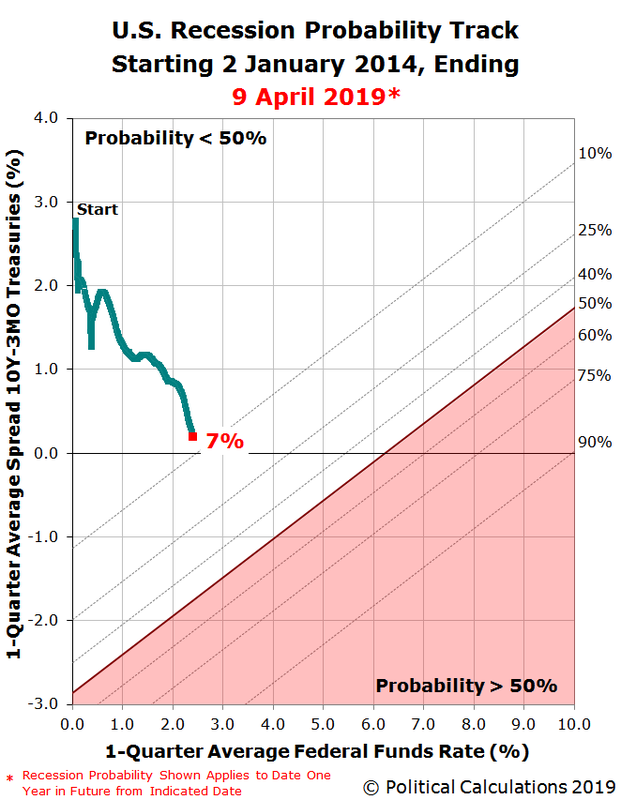 The Recession Probability Track visualizes how the odds of an official U.S. recession starting have increased from January 2, 2014, through April 9, 2019. We appreciate that we're stretching the capabilities of Wright's model, which was developed using historical data where the Federal Funds Rate was typically much higher than it is at present at the times when the National Bureau of Economic Research has previously determined recessions in the U.S. economy to have begun. It's really easy. Plug in the most recent data available, or the data that would apply for a future scenario that you would like to consider, and compare the result you get in our tool with what we've shown in the most recent chart we've presented.